David Jeffrey is back in football after being appointed the new manager of Ballymena United. Jeffrey put pen-to-paper on a three-year deal with the Showgrounds club on Monday. 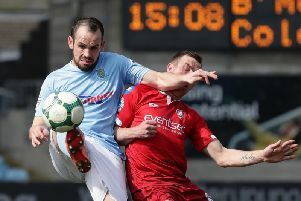 It comes one week after the Sky Blues sacked Glenn Ferguson following a run of five straight defeats in the Danske Bank Premiership. Jeffrey has been out of management since leaving Linfield in May 2014. The 53-year-old spent 17 years at Windsor Park and claimed 31 trophies. “I hadn’t anticipated a return to football at this time, it was a surprise to get the call from Don Stirling inviting me for talks,” Jeffrey told the club’s official website. “What has been most impressive is the professional way the club have conducted the meeting and negotiations. The challenge and aspirations of the board were incredibly appealing, and when you look at the Showgrounds complex as well as how I was dealt with, it all contributed to my decision. Brian McLaughlin has also been confirmed as assistant manager to Jeffrey.